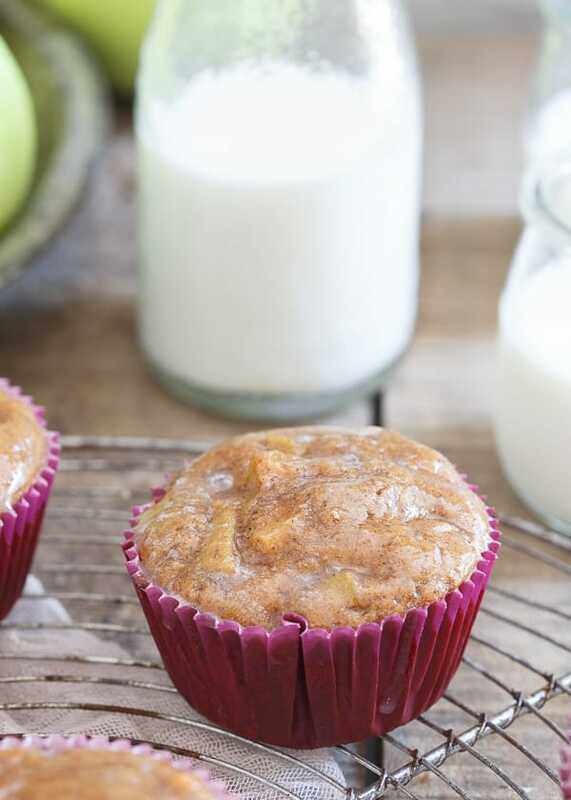 These apple fritter muffins are made with tiger nut flour and tiger nut oil for a gluten free treat that’s perfect for fall. *Post updated 10/4/2017 – now includes a video (scroll down to watch!) 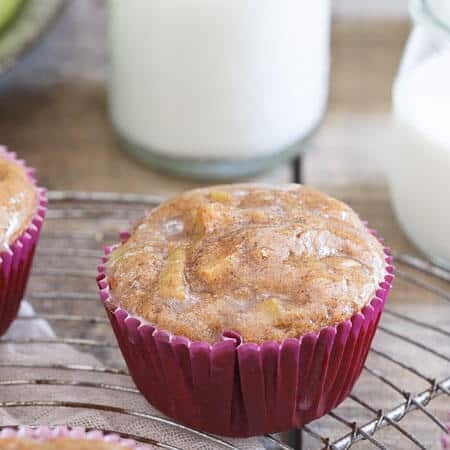 on how to make these apple fritter muffins and an easy alternative to the tiger nut flour and oil used in the original recipe. See recipe below for alternative options. A couple of years ago I made apple fritter muffins for a freelance article. They were beyond delicious (and one of my last happy memories with my Grandma who called me to tell me as much when I brought her a few right after she was diagnosed with pancreatic cancer) but also made with your typical AP flour and sugar mixtures, two things I don’t regularly eat any longer. That said, I’ve been wanting to recreate that recipe ever since making it healthier all around. Having picked up my first bunch of local apples this past weekend, I figured now was as good a time as any. I contemplated making these paleo, but when it comes to a fritter, the glaze is just a necessary component. I wasn’t going to sit here concocting a coconut butter glaze and try to tell you it tastes like the real deal apple fritter glaze, it just wouldn’t in this application. Sometimes you need a little powdered sugar in your life. The muffin itself though is as clean eating as a whistle made with all purpose gluten free baking flour and tiger nut flour. While I’ve waxed poetically about my love of gluten free baking flour plenty of times, Organic Gemini’s tiger nut flour is a new to me product. It’s a flour made from the tiger nut, a small root vegetable (not actually a nut as its name suggests) packed with iron, fiber and potassium. The flour itself is hearty with a nutty undertone and from my experience so far, acts a lot like almond or cashew flour would in baking. I also used their tiger nut oil in these apple fritter muffins instead of my usual baking oils to complement the nuttiness of the flour. The result is these gluten free treats perfect for snacking as fall rolls in. If you’re being super healthy, sure, skip the glaze or go ahead and try to make one with coconut butter and some lemon juice but honestly, the real deal powdered sugar glaze is where it’s at for these. These apple fritter muffins are made with tiger nut flour and oil for a gluten free treat that's perfect for fall. Add the tiger nut oil to a medium skillet over medium heat. Add the apples, cinnamon, sugar and water then mix to combine. Cook for about 3 minutes until apples are softened. Turn off the heat, add the tapioca flour, mix and set aside. Preheat oven to 400 degrees and line 9 muffin tins with liners. In a medium bowl, combine the flours, baking powder, baking soda, salt and cinnamon. Whisk together the applesauce, tiger nut oil, vanilla, egg, coconut sugar and milk in a large bowl. Fold in the apples from the skillet and mix until combined. Spoon the batter into the muffin liners and bake for about 15 minutes. Remove from oven and let cool in the muffin tin for 5 minutes before transferring to a cooling rack. While the muffins cool, whisk the ingredients for the glaze together in a small bowl. Once muffins have cooled for about 15 minutes on the cooling rack, dip the tops into the glaze and place back on the rack. You can dip the muffins 2-3 times depending on how thick you want the glaze, just wait about 5 minutes in between to give the layers of glaze a chance to thicken. *Thanks to Organic Gemini for sponsoring this post. All content and opinions are my own. Personally, I always need a little powdered sugar in my life. These muffins look and sound amazing, I’m so glad you glazed them with the real deal. These look delicious, Gina- i’m glad you were able to recreate it to suit your eating style while still having those awesome memories of your grandma :) I’ve heard of tiger nut flour but wasn’t familiar with it in baked goods- Those look epic! I have been dying to try this new Tiger Nut Flour! I have been seeing it pop up EVERYWHERE, and I’ve been wanting to get my bake on. These muffins look AMAZING and, you’re right, you NEED that glaze! Pinned! 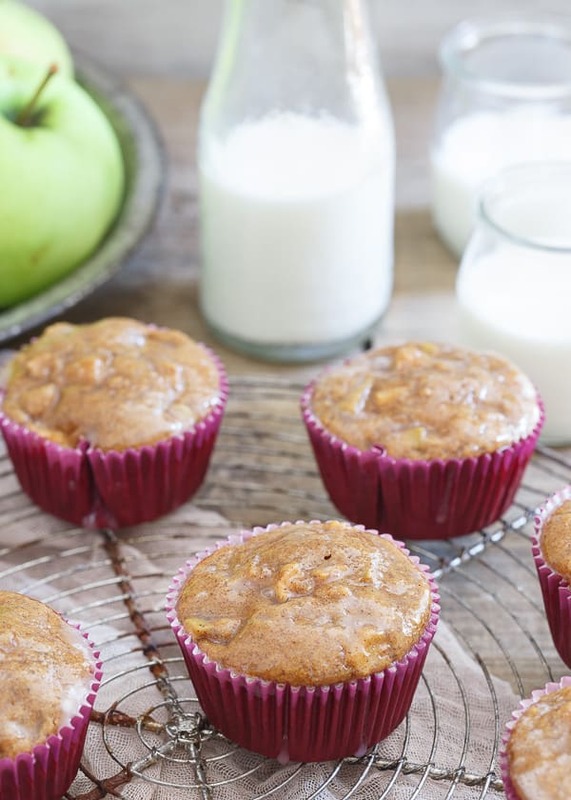 These apple fritter muffins look awesome! I would happily eat a few of these for breakfast….or a late night treat :) I have never seen the Tiger nut flour but I’m intrigued! Totally interested in the tiger nut flour…going to check it out. And these MUFFINS!!!! Apple fritters are my favorite! I’m so glad you made them healthier so I can eat them more often. 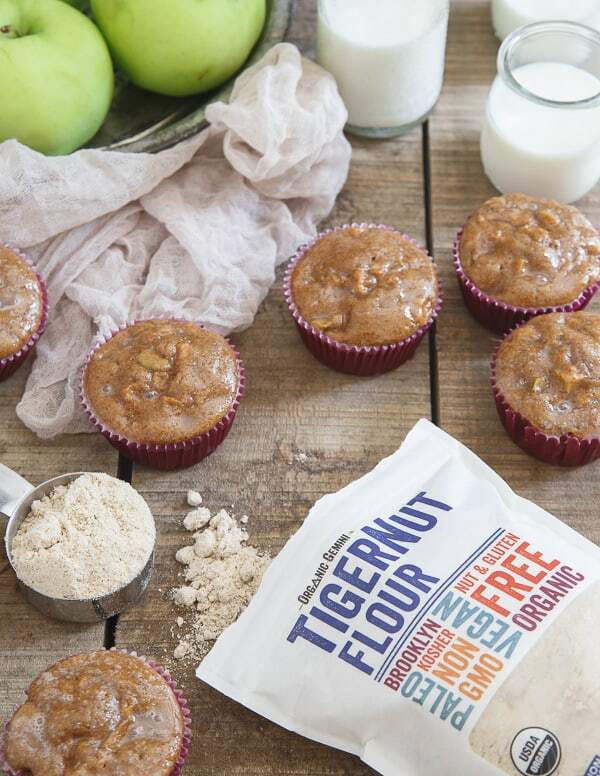 I’ve never heard of Tiger Nut Flour, but it sounds like an amazing gluten free option! These look so good and I love that they are guilt free!! I’ve never seen this flour before – love it! I have never heard of Tiger Nut Flour…interesting! I love finding new flours to use in baking. These look great! Hi Gina! I was wondering if I could replace tapioca flour/starch with cornstarch or another type of starch. Definitely, corn starch will work just as well! I’ve never heard of tiger nut flour before and I’m curious! These muffins look fantastic and a little glaze is good for everyone! These look so good! I’ve never heard of that flour but I’ll have to add it to my list! I have been dying to try Tiger flour! It would be perfect for all the muffins I make.